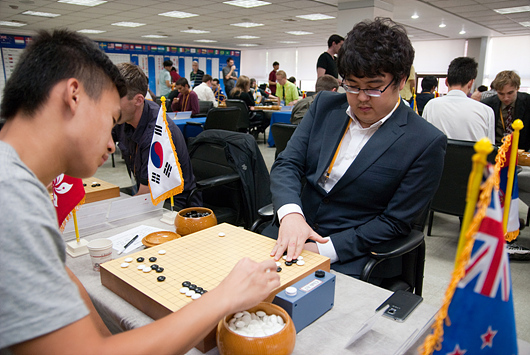 Wei TaeWoong who is a representative of Korea won 3 games in a first day. He got Korea Baduk fan¡?s expectations on his shoulder and will meet other competitors next day. Wei TaeWooong won against Ukraine, Sauth Africa, Hong Kong¡?s representatives from round 1 to round 3 on 19th. Korea¡?s rivals are China, Japan and Taiwan. Hu YuChing a representative of China got also 3 wins in the first day. In another match, Japan and Taiwan competed in the round 3, Chen JungSun from Taiwan won against Yoshiyuki Shicimune from Japan and got into the leading group. There are 6 countries¡? representatives which got 3 wins in the first day. Korea, China, Russia, Taiwan, America and Serbia. On the next day, the following matches from round 4 to round 6 are going to be played and decide for winner. After that, the awards ceremony is supposed to be followed directly.